The Turkish lira rebounded, recouping losses after its worst day since a crash last year, as the central bank raised borrowing costs and signaled it was taking steps to bolster its official reserves. The currency clocked up an almost 3 percent gain after policy makers forced commercial lenders to borrow from its more expensive overnight funding window and cut them off from a daily one-week dollar swap auction, a move that could potentially add $2.5 billion to its coffers this week -- the outstanding amount on the facility. The regulator has been seeking to end speculation that it was using its foreign-currency stockpile to support the lira before the March 31 elections, after data last week showed net reserves unexpectedly fell by the most since January 2014 in the first two weeks of March. The lira dropped more than 5 percent on Friday, prompting authorities to start investigations into JPMorgan Chase & Co. and other banks for stoking the rout. The lira strengthened 3.1 percent as of 4:15 p.m. in Istanbul. By driving banks to the overnight lending window at 25.5 percent, the central bank stands to raise the cost of funding by 150 basis points over the course of a week. 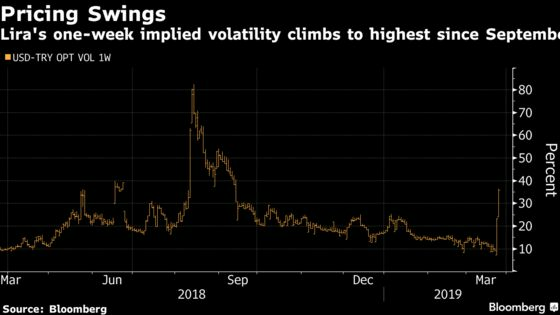 “If the pressure on the lira does not abate, the next step can well be to resort to late-liquidity window again,” Inan Demir, an economist at Nomura International Plc in London, said, referring to the bank’s most expensive funding window at 27 percent. Still, unease after Friday’s meltdown continued to reverberate across markets, where signs are growing that despite the lira’s recovery traders are shunning the nation’s assets. The currency’s one-week volatility implied by options -- which overlaps the municipal elections on March 31 -- extended its advance on Monday to the highest level since September. The overnight-swap rate derived from forwards surged to more than 80 percent, the highest level since at least 2001, while credit default swaps pushed above 420 basis points. The benchmark Borsa 100 Istanbul Index also edged lower, led by declines in some of the nation’s largest lenders. Akbank TAS fell as much as 5.8 percent, after closing 7.7 percent lower on Friday. Turkiye Garanti Bankasi AS fell for a second day to a two-week low. The central bank said on Monday it was “decisive about its policy towards reinforcing its reserves” and reiterated its pledge to maintain price stability. On Friday, a central bank official said the draw in its foreign currency buffer wasn’t anything out of the ordinary, citing foreign-debt repayments and sales to state-owned energy companies that can result in rapid changes in foreign reserves. The rout comes after local investors accumulated around $25 billion of hard currency since September, a hedge against runaway inflation and uncertainty over the direction that policy will take after the vote. President Recep Tayyip Erdogan warned on Sunday that bankers deemed responsible for speculating against the currency would be punished.